For other uses, see Decius (disambiguation). Decius (/ˈdiːʃəs, ˈdɛʃəs/; Latin: Caesar Gaius Messius Quintus Trajanus Decius Augustus; c. 201 – June 251), also known as Trajan Decius, was Roman Emperor from 249 to 251. A distinguished politician during the reign of Philippus Arabus, Decius was proclaimed emperor by his troops after successfully putting down a rebellion in Moesia. In 249, he defeated and killed Philip near Verona and was recognized as emperor by the Senate afterwards. During his reign, he attempted to strengthen the Roman state and its religion, leading to the Decian persecution, where a number of prominent Christians (including Pope Fabian) were put to death. In the last year of his reign, Decius co-ruled with his son Herennius Etruscus, until they were both killed by the Goths in the Battle of Abritus. Antoninianus of Trajan Decius. Inscription: IMP. C. M. Q. TRAIANVS DECIVS AVG. Decius, who was born at Budalia, near Sirmium in Pannonia Inferior (now Martinci and Sremska Mitrovica in Serbia), was one of the first among a long succession of future Roman Emperors to originate from the Danube provinces, often simply called Illyricum. Unlike some of his immediate imperial predecessors such as Philip the Arab or Maximinus who did not have extensive administrative experience before assuming the throne, Decius was a distinguished senator who had served as suffect consul in 232, had been governor of Moesia and Germania Inferior soon afterwards, served as governor of Hispania Tarraconensis between 235–238, and was urban prefect of Rome during the early reign of Emperor Philip the Arab (Marcus Iulius Phillippus). Around 245, Philip entrusted Decius with an important command on the Danube. By the end of 248 or 249, Decius was sent to quell the revolt of Pacatianus and his troops in Moesia and Pannonia; some modern historians see this rebellion as a reflection of emerging Balkan separatism. After the collapse of the revolt, Decius let the troops proclaim him Emperor. Philip advanced against him and was killed at Verona, Italy, in September 249. 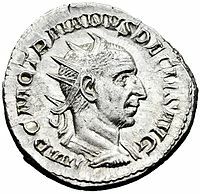 The Senate then recognized Decius as Emperor, giving him the attribute Traianus in reference to the emperor Trajan. According to the Byzantine historian Zosimus, Decius was clothed in purple and forced to undertake the [burdens of] government, despite his reluctance and unwillingness. 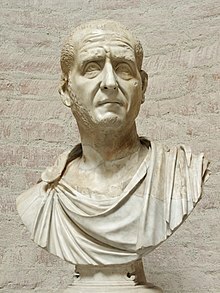 Decius' political program was focused on the restoration of the strength of the State, both militarily opposing the external threats, and restoring the public piety with a program of renovation of the State religion. Either as a concession to the Senate, or perhaps with the idea of improving public morality, Decius endeavoured to revive the separate office and authority of the censor. The choice was left to the Senate, who unanimously selected Valerian (the future emperor). But Valerian, well aware of the dangers and difficulties attached to the office at such a time, declined the responsibility. The invasion of the Goths and Decius' death put an end to the abortive attempt. During his reign, he proceeded with several building projects in Rome, "including the Thermae Decianae or Baths of Decius on the Aventine", which was completed in 252 and survived through to the 16th century; Decius also repaired the Colosseum, which had been damaged by lightning strikes. All the inhabitants of the empire were required to sacrifice before the magistrates of their community 'for the safety of the empire' by a certain day (the date would vary from place to place and the order may have been that the sacrifice had to be completed within a specified period after a community received the edict). When they sacrificed they would obtain a certificate (libellus) recording the fact that they had complied with the order. That is, the certificate would testify the sacrificant's loyalty to the ancestral gods and to the consumption of sacrificial food and drink as well as the names of the officials who were overseeing the sacrifice. According to D. S. Potter, Decius did not try to impose the superiority of the Roman pantheon over any other gods. It is very probable that the edict was an attempt to legitimize his position and to respond to a general unease provoked by the passing of the Roman millennium. While Decius himself may have intended the edict as a way to reaffirm his conservative vision of the Pax Romana and to reassure Rome's citizens that the empire was still secure, it nevertheless sparked a "terrible crisis of authority as various Christian bishops and their flocks reacted to it in different ways." Measures were first taken demanding that the bishops and officers of the church make a sacrifice for the Emperor. The sacrifice was "on behalf of" (Latin pro) the Emperor, not to the Emperor, since a living Emperor was not considered divine. Certificates were issued to those who satisfied the commissioners during the persecution of Christians under Decius. Forty-six such certificates have been published, all dating from 250, four of them from Oxyrhynchus. Anyone, including Christian followers, who refused to offer a sacrifice for the Emperor and the Empire's well-being by a specified date risked torture and execution. A number of prominent Christians did, in fact, refuse to make a sacrifice and were killed in the process, including Pope Fabian himself in 250, and "anti-Christian feeling[s] led to killings at Carthage and Alexandria." In reality, however, towards the end of the second year of Decius' reign, "the ferocity of the [anti-Christian] persecution had eased off, and the earlier tradition of tolerance had begun to reassert itself." The Christian church, despite no indication in the surviving texts that the edict targeted any specific group, never forgot the reign of Decius whom they labelled as that "fierce tyrant". At this time, there was a second outbreak of the Antonine Plague, which at its height from 251 to 266, took the lives of 5,000 daily in Rome. This outbreak is referred to as the "Plague of Cyprian" (Cyprian was the bishop of Carthage, where both the plague and the persecution of Christians were especially severe). Cyprian's biographer Pontius gave a vivid picture of the demoralizing effects of the plague and Cyprian moralized the event in his essay De mortalitate. In Carthage, the "Decian persecution", unleashed at the onset of the plague, sought out Christian scapegoats. Decius' edicts were renewed under Valerian in 253 and repealed under his son, Gallienus, in 260-1. The barbarian incursions into the Empire were becoming more and more daring and frequent whereas the Empire was facing a serious economic crisis in Decius' time. During his brief reign, Decius engaged in important operations against the Goths, who crossed the Danube to raid districts of Moesia and Thrace. This is the first considerable occasion that the Goths — who would later come to play such an important role — appear in the historical record. 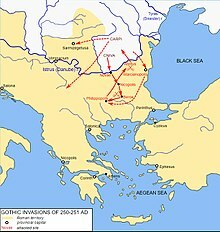 The Goths under King Cniva were surprised by the emperor while besieging Nicopolis on the Danube; the Goths fled through the difficult terrain of the Balkans, but then doubled back and surprised the Romans near Beroë (modern Stara Zagora), sacking their camp and dispersing the Roman troops. The Goths then moved to attack Philippopolis (modern Plovdiv), which fell into their hands. The governor of Thrace, Titus Julius Priscus, declared himself Emperor under Gothic protection in opposition to Decius but Priscus's challenge was rendered moot when he was killed soon afterwards. Then the invaders began returning to their homeland, laden with booty and captives, among them many of senatorial rank. The Decii (i.e., Decius and his son), while pursuing the barbarians across the Danube, died through treachery at Abritus after reigning two years. ... Very many report that the son had fallen in battle while pressing an attack too boldly; that the father however, has strenuously asserted that the loss of one soldier seemed to him too little to matter. And so he resumed the war and died in a similar manner while fighting vigorously. One literary tradition claims that Decius was betrayed by his successor, Trebonianus Gallus, who was involved in a secret alliance with the Goths, but this cannot be substantiated and was most likely a later invention since Gallus felt compelled to adopt Decius' younger son, Gaius Valens Hostilianus, as joint emperor even though the latter was too young to rule in his own right. It is also unlikely that the shattered Roman legions would proclaim as emperor a traitor who was responsible for the loss of so many soldiers from their ranks. Decius was the first Roman Emperor to die in battle against a foreign enemy. ^ In Classical Latin, Decius' name would be written as CAESAR GAIVS MESSIVS QVINTVS TRAIANVS DECIVS AVGVSTVS. ^ a b c Chisholm 1911. One or more of the preceding sentences incorporates text from a publication now in the public domain: Chisholm, Hugh, ed. (1911). "Decius, Gaius Messius Quintus Trajanus" . Encyclopædia Britannica. 7 (11th ed.). Cambridge University Press. p. 913.